Synopsis: The groundbreaking five-man sketch comedy troupe discovered by SNL’s Lorne Michaels in the late 1980s took their blockbuster live shows from the packed performance spaces in and around Toronto, Canada and brought it right into the living rooms of Canadian and American audiences desperate for hilarious, edgy, timeless, REAL takes on who we are and what we think when we’re not trying to be polite. No subject is too sacred; no corner of the human experience is too strange or too scary to hide from the harsh but blisteringly funny comments KITH have to make on them. I was in high school in the early 90's when I caught up with The Kids in the Hall, I probably caught in re-runs on HBO and CBS, and while some of the CBS stuff was censored the uncanny brilliance of the Canadian sketch comedy troupe still came through, a demented slice of maple-blooded comedy that was more akin to the cross-dressing oddness of Monty Python's Flying Circus than it was Saturday Night Live. It was a different breed of comedy and it fast became an after school staple for myself, it wasn't just the usual sketch comedy like SNL, it also featured an ironic breaking of the fourth wall, characters appearing as themselves addressing the audience as part of the sketch, then there were the bizarre monologues from gay character Buddy Cole as played by gay man Scott Thompson, it wasn't a comedy show that was afraid to tackle gay comedy, and not necessarily in an exploitative way either. My favorite reoccurring sketches were '30 Helens Agree' and "It's a Fact", Mark McKinney's half-human half-chicken oddity 'The Chicken Lady' and "I'm Crushing Your Head', the ladder of which I would imitate non-stop when amongst my friends, sorry guys. Other standouts include Stephen Thompson's aforementioned gay monologue character Buddy Cole and the good Samaritan skit 'Running Faggots', and how could I forget the Canadian fur-trappers skit with Dave Foley and Kevin McDonald canoeing through an office building trapping businessmen for their fine designer suits, love that stuff. This is also the show that introduced me to the instrumental surf-rock band The Shadowy Men On a Shadowy Planet, who performed their theme song "Having an Average Weekend. 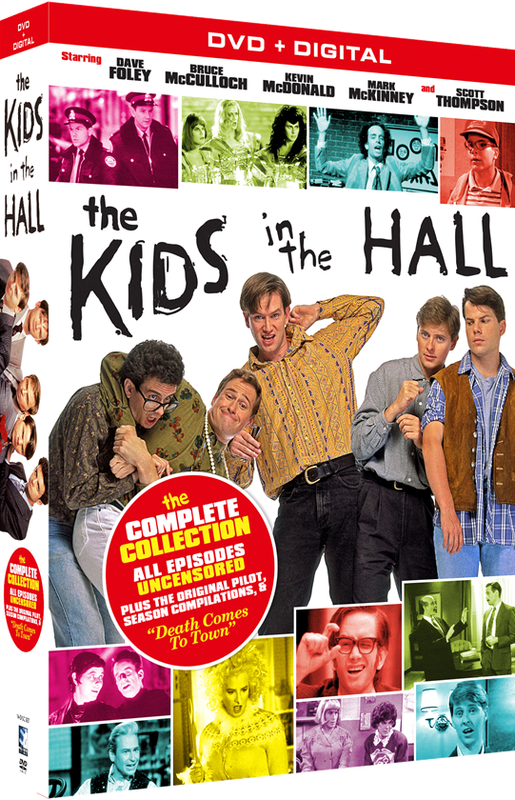 The Kids in the Hall: The Complete Collection arrives on 12-disc DVD from Mill Creek Entertainment, it collects not just the original five seasons but the 2008 mini-series Death Comes To Town which aired on IFC, plus select cast commentaries, the rare HBO pilot episode, season favorite compilations, vintage Rivoli Theatre performances, and a digital copy of the whole set to stream it on Mill Creek's streaming service. About the only thing I noticed missing that I would have wanted is the Kids in the Hall movie Brain Candy (1996), but I own the DVD so I'm okay with it's omission. As far as packaging this is my first TV show collection from Mill Creek in recent years, and I didn't much care for it, all 12 discs are housed on six double-sided cardboard sleeve sheets which are pure hell on the discs themselves, causing disc wear just from the normal unsheathing of the discs for play. The case itself is a pretty sturdy box, all six cardboard sleeves slip into it, with a flimsy piece of cardboard placed over the top-side opening of the box. I removed the discs from the cardboard and placed them into paper sleeve and slipped those back into the box to prevent any further damage to the disc. I would have preferred the old style Mill Creek packaging of the stacked spindle or the paper sleeves to what this style of packaging.